It’s an exciting time, as we count down the days until the 2015 Epcot International Flower and Garden Festival gets underway! Of course, around here, we’re most interested in the Outdoor Kitchens! 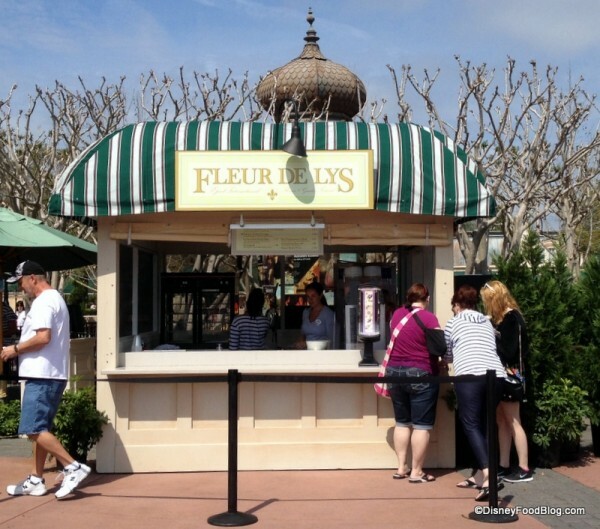 We’re so excited to see the return of these kiosks stationed around World Showcase. 2015 will mark the third consecutive year that guests of the Festival can enjoy sips and tapas-sized dishes, themed to celebrate the bounty of the garden. And while we’re still awaiting the full menus, we do have some news regarding some of the new dishes that will debut at this year’s festival. First off, let’s discuss which Outdoor Kitchens you can expect to see this year. While we haven’t heard word which Kitchen from 2014 won’t return, we know that Botanas Botánico will debut. 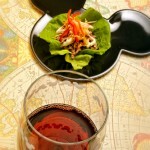 Check out this post about Botanas Botánico to learn more about its menu. That means we anticipate at least one 2014 Kitchen will be absent, as we expect there to be 11 kitchens. Does that mean that the Buttercup Cottage in the UK Pavilion gets the axe this year? We super hope not — the Biscuit with Smoked Salmon Tartare and the Lemon Scones were to die for last year!! As far as dishes go, there are certainly some exciting things that we can’t wait to try. We hear that fan favorites, like Frushi, will return. Chefs will also take advantage of the Florida strawberry season once more by offering Beijing Candied Strawberries. But we also have a few details on brand new menu items. 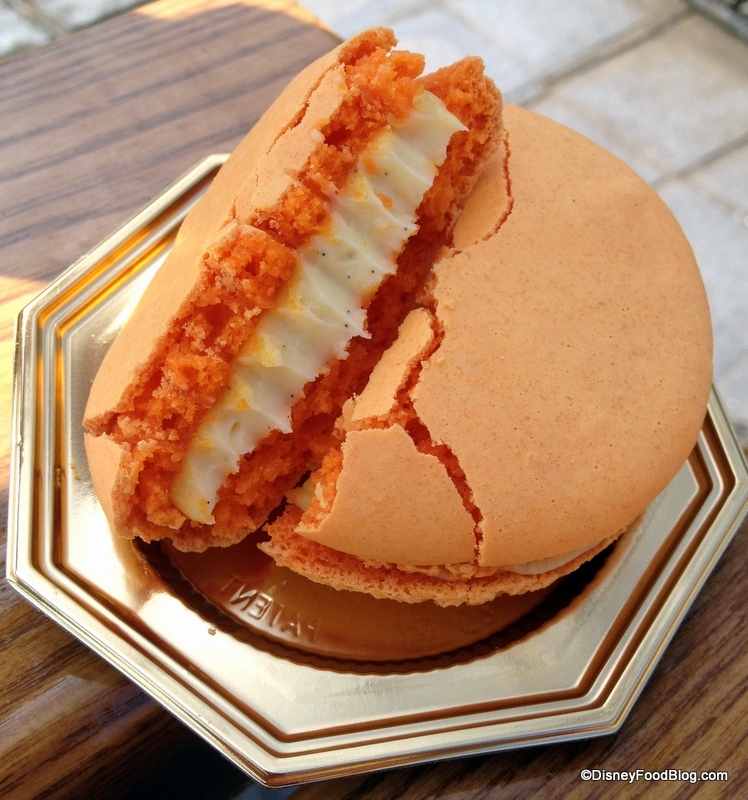 Look for the Macaron Guimauve à la Fraise, a strawberry marshmallow macaron, at Fleur de Lys. We Don’t Know How It Can Be Better Than Last Year’s Orange Blossom Macaron, But We’re Willing To Try It! Falafel with Cucumber Tomato Salad and Tahini will debut at Taste of Marrakesh. Kale Salad with Dried Cherries, Almonds, and Goat Cheese and a Quinoa Vegetable Naanwich with Arugula Pesto and Oven-Dried Tomatoes make the menu at Urban Farm Eats. Definitely some exciting vegetarian options to look forward to! Last year, we thoroughly enjoyed the Limoncello Cheesecake on offer at Italy’s Primavera Kitchen. This year, we have a Limoncello Panna Cotta to look forward to. Pineapple Promenade seems to be expanding their menu in a fun way this year, as they offer a Spicy Hot Dog with Pineapple Chutney and Sriracha Mayo. All in all, it’s shaping up to be another Flower and Garden Festival that will be as delicious as it is beautiful! 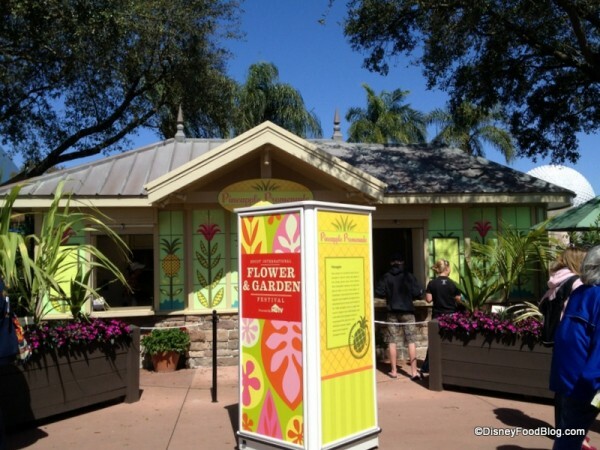 Stay tuned for more details on beverages at this year’s Flower and Garden Festival as well as the full menus! What are you most looking forward to enjoying this year at the Flower and Garden Festival Outdoor Kitchens? Leave a comment and let us know! 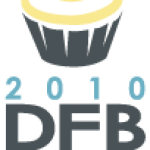 I’m sure the Piggylicious Cupcake will be back — it’s in the Epcot Festival Cookbook that was published last fall so it should be safe for a couple of years. All of it sounds great to me. I can’t wait to hear more reports. 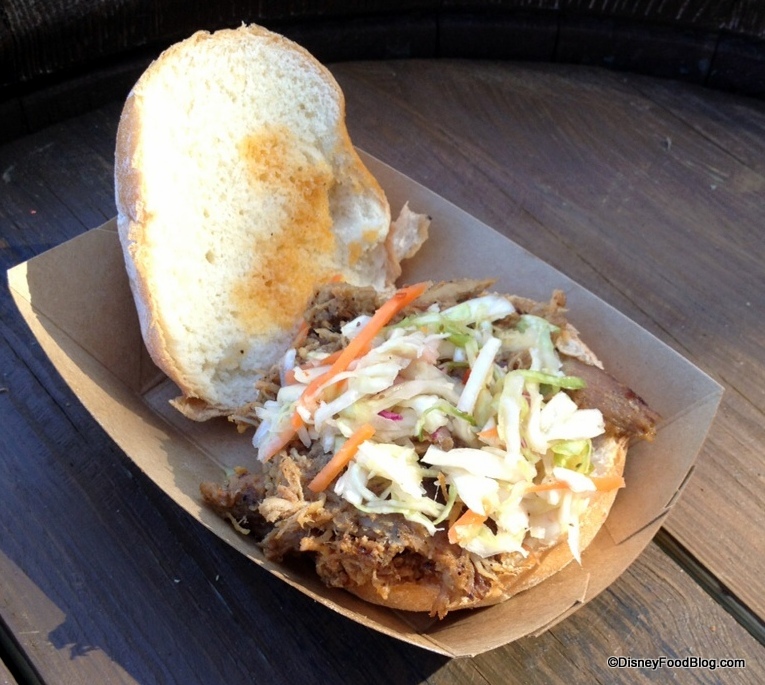 If I had one request, it would be for Disney to please please please leave the smokehouse up in the American Adventure through July Fourth. What is more American than bbq? It’s out of the line of traffic and would fit in perfectly through Memorial Day and Independence Day. It’s unfortunate so many kitchens have chosen to feature strawberry items, many people are allergic to them. Yay! The Food and Garden Festival…I mean, Flower and Wine Festival…I mean, Flower and Garden and Food Festival. I’m so sad I will miss the Flower & Garden fest by 1 day (I return home March 4)!! Can’t wait! 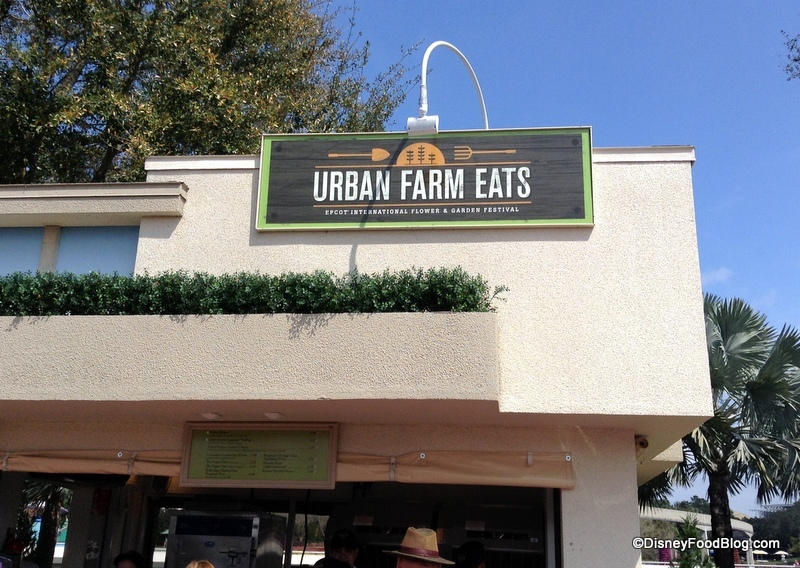 All the veggie options at Urban Farm Eats sound delicious, and that Beef Brisket Burnt Ends Hash gave me the exact same reaction as you… WUT????!?!?!?! ^^^Amanda, in years past, the Festival has opened a day early for media and soft openings. Fingers crossed you can check it out on the 3rd before you leave?! The Frushi is so cute!!!!! 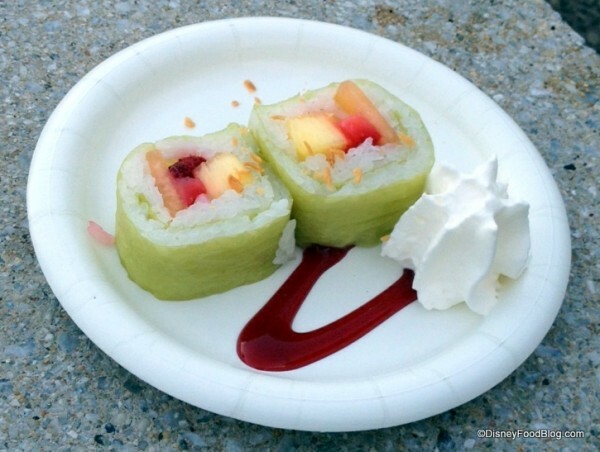 Do you know what the thin green stuff is that the Frushi is wrapped in? I’m going there to see The Flower and Garden Show in March 9th . Can’t wait to see the flowers. Looking forward to trying some delicious food. The candied strawberries look amazing! Hannah — They’re “soy wrappers”. Check out this fun recipe that we featured a while back for making frushi at home! Brooke…Thanks for the quick answer and the recipe! How fun this will be. There should be lots of strawberries! The whole point of the festival should be to encourage local & seasonal product. There’s a huge strawberry festival not too far from Buena Vista so it really fits. 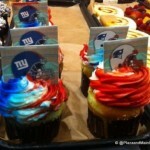 It’s unfortunate for those with allergies but that’s bound to happen in the season. I feel like it’s the better option to them using something out of season that’s lost all its flavor or has been pumped full of sugar. And there will be plenty non-strawberry foods to enjoy, plus an entirely different festival later in the year that should have a focus on other product. Don’t be disappointed, just avoid. There’s only 3 things so far after all. The Buttercup Cottage is almost certainly gone. 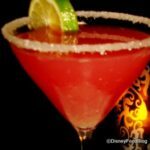 Their berry tea cocktail is now being served at Pineapple Promenade. So sad because that Salmon potato biscuit sounds delicious. Paul — Agreed. That move of the berry tea cocktail caught our attention too. It was one of my favorite booths, so I’ll be sad if it’s not included this year. I am SO sad to think that the Buttercup Cottage is gone! That salmon potato biscuit was by far my favorite item at the festival last year. It was the last item I tried and I wish I had gotten it earlier so I could have had it more than once! 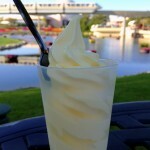 Will they be having the dole whips with rum again? I hope so! Danielle — We are still awaiting the full menus. We’ll let you know as soon as we get word…but we certainly hope so. 😀 And since the return of Pineapple Promenade is confirmed, I figure the chances are pretty good. The two new items I am excited to try this year are: Beef Brisket Burnt Ends Hash with White Cheddar Fondue and Pickled Jalapeños & Falafel with Cucumber Tomato Salad and Tahini. I’m hoping the falafel will be good. 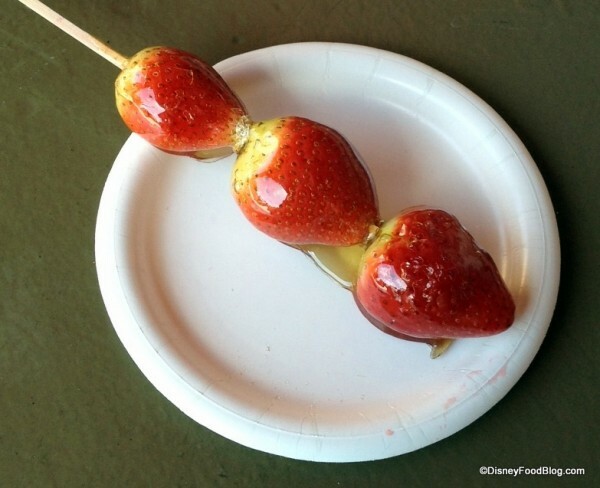 The only experience I’ve had w/falafel at Disney was at The Mara & I did not care for it. It seems hard to find good falafel these days. I wonder why they are waiting so late to release the full menus this year? Looking forward to the Frushi the most. Tried it 2 years ago and absolutely loved it. I’m getting a double order this year! Can’t wait to try the spicy hot dog too- sounds yummy! What are the prices of the offerings? And can you use your dining snack credits or at least pay for the items with the credit card linked to the magic band? Steven — Prices haven’t been released yet. Keep checking back; we’ll update our menu pages with prices and DDP snack credit info as soon as we have it. We expect that you’ll be able to use Touch to Pay with your Magic Band for Flower and Garden, since it was available at Food and Wine.